» We Struck a High-banking Production Record at the Mega Hole! There were 23 participants on this surface mining Project, including myself. We decided to do it on the Club’s K-15A property. 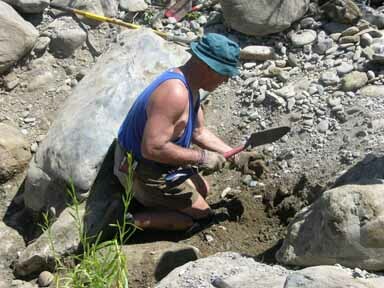 Our shore boss, Otto Gaither and several other New 49’er members had discovered high-grade gold on the gravel bar towards the upper-end of this very long mining property the season before. Since K-15A is such a long mining claim, we figured the small amount of earlier mining activity could barely have scratched the surface of the larger gold deposits which were sure to extend across the entire gravel bar. 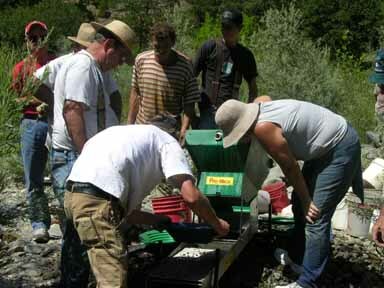 The secret to our continuous success on these Projects is that we just follow through on an aggressive sampling program into areas where other New 49’er members have already discovered gold during the past. 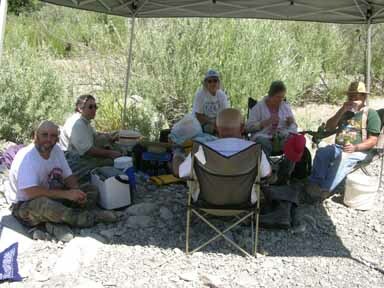 Once again, Otto suggested that we set up our camp on one of the Club’s long-term camping areas on http://www.goldgold.com/k-15a-mega-hole.html K-15A. This is one of our favorite camping areas, because it has so much natural shade. We devoted the first day (Saturday) on this Group Project to organizing our group camp, and to get all of our mining equipment set up along side of the river. With all the enthusiasm of this group, we still had time to start sampling on Saturday afternoon before we knocked off to attend the weekly potluck. 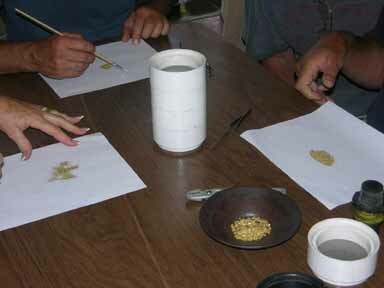 Using gold pans to test with, it did not take long for this crew to establish that high-grade gold was present where we intended to start up the high-bankers on the following day. My trusty assistants, Craig Colt, Mike O’Connell, Pat Harris and Leif Sollier were all present on this Project to lend a hand. Our shore boss, Otto, was also there to help organize all of our ongoing support needs, participate in the mining activity and help with everything else that needed doing. Since Otto was basically turning one of his own high-grade gold strikes over to this Project, we were depending upon him during the first few days to help us start building up some gold in our recovery bucket. Our plan was to start the week off mining the pay-streak that Otto had already located. 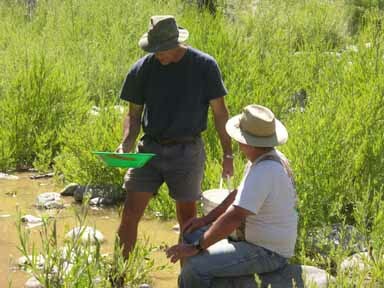 Then, we would send sampling teams out across the (very) extensive area in search of perhaps an even richer gold deposit. It is always nice to start one of these Projects mining gold on the very first day. That gets things off in the right direction from the very beginning. Then, through some aggressive sampling, we are nearly always able to find one or more additional gold deposits nearby that are just as good or better than the one we started with. 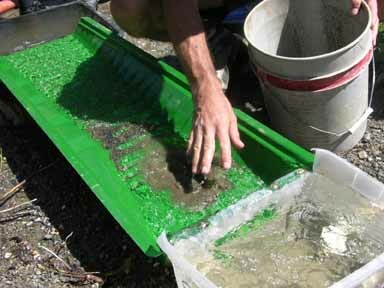 Finding a new gold deposit always adds a great feeling of success to the Project. We devoted the second and third days to dialing in some team production using three separate high-bankers. 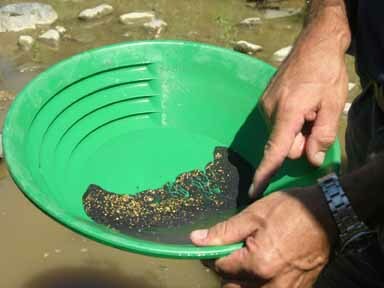 Through a little trial and error, we established that the high-grade gold was located within a contact zone between two different layers of streambed, only about eight inches beneath the surface. This made for some pretty easy digging! 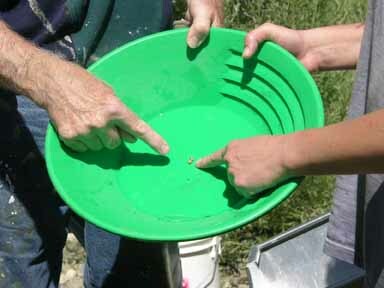 It didn’t take us long to work out a system of filling buckets with pay-dirt to be run through one of the high-bankers. The nice thing about using the dredge attachment on a high-banker well up on a gravel bar in California is that the activity does not normally require a dredging permit. But you must make certain there is no discharge of dirty water or other material off the stream bank into the active waterway. Fortunately, natural contours on the upper gravel bar at K-15A provide a huge settling area where this can be accomplished. We worked out a rotation so that everyone was able to spend some time working the suction nozzles on these high-bankers. Earlier in the week, we had pulled two of the Club’s rafts out of storage in anticipation of maybe using them to do some sampling in some of the more-remote high-banking areas located on K-17. I know of one place in particular down there where we could likely get into a pretty good deposit of nice gold nuggets. Earlier in the week, everyone was pretty excited about the prospect of a nugget deposit (and an exciting day rafting down the river). But on the morning of the forth day, Otto informed me that this group had already voted unanimously to save K-17 for a later Project. 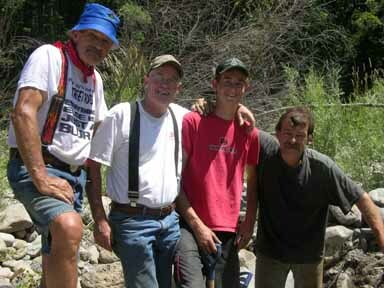 They decided we were finding too much gold to leave the place we had started and go on a rafting trip somewhere else! With that in mind, on the forth morning, Craig and Leif both led separate prospecting teams out across the huge bar on K-15A. 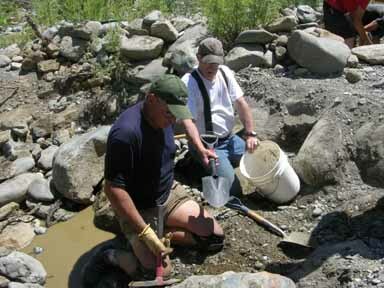 They were in search of new and better high-grade gold deposits. While Leif’s team was starting to turn up some positive signs in one area, at about mid-day, someone from Craig’s team came down and told me that Craig had located a rich virgin gold deposit up towards the very top-end of the bar. Off I went to see what he had turned up. It was quite a ways up there; this is a very large high-banking area which is sure to keep a lot of people happy for many years to come! Since we were already getting so much gold using the dredge attachments on the high-bankers further downstream, we decided the smart thing to do was to just move the third high-banker to Craig’s discovery as the first step. 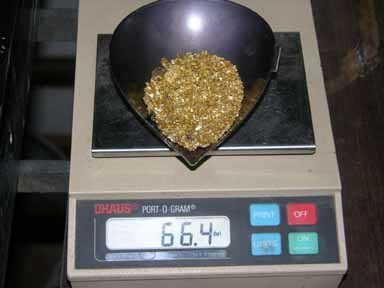 But after running the first production sample up there, we realized that we could get more gold in the new location. Shortly thereafter, our entire crew was busy moving all of our gear to the top of the bar. Since we were finished in Otto’s initial discovery (until we go back there some day), we carefully filled in the excavations so no open holes would be left behind. There is a turning point in every one of these Projects when some new development changes the group chemistry into something new and different. 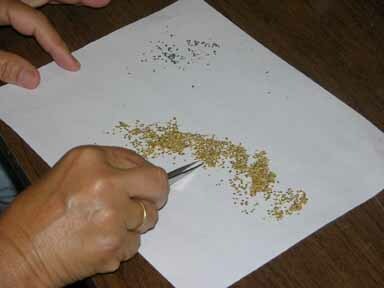 This usually happens when sampling turns up a new, richer gold deposit. The new discovery often triggers a sudden cumulative motivation to recover as much of the gold that we can get in the time remaining in the Project. Everyone gets into the spirit of this. I patiently wait for this transition on every Project, sometimes worrying that it will not happen. On one of the dredging Projects last season, since the river was still too high and fast to allow us to sample out in the middle of the river, our sampling team was experiencing frustration all the way through the fifth day, because I kept pulling them out of the lower-grade gold deposits they were finding, in hopes of finding something better. We finally touched down on high-grade on the morning of the sixth day. We then had all the participants go down and experience what it feels like to see bedrock cracks which are laced with rich, beautiful gold and nuggets as we uncovered a treasure of Mother Nature’s natural wealth. Then, everybody understood what we had been holding out for all week long. As a very determined team, they pulled themselves together and recovered more gold in several hours than we had already accumulated in five days of hard work! Once that kind of motivation kicks in, I usually just step back and let it go. The fifth and sixth days on this high-banking Project found our entire crew working together to keep two hungry high-bankers well fed with good pay-dirt that was being excavated from three separate holes. We were digging deeper in this new location, so we decided against using the dredge attachments. Dredging would have filled the deeper holes with water, preventing us from being able to effectively deal with the bigger boulders in this place. 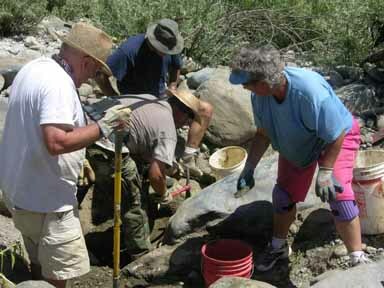 Indeed, Craig had located an old original (never been touched by earlier mining activity) streambed which was packed-up with medium-sized granite boulders. In order to open up the excavations so that we had some working room, we set up a portable grip-puller, hand-operated winch so that we could pull several of the boulders out. With some teamwork, this did not take very long. As usual, Leif (nick-named “Hercules”) insisted upon doing most of the heavy work. Here follows a video segment that was captured as we were working the newly-found pay-streak. Check out the size of those boulders! Mainly, the fifth and sixth days of this Project involved non-stop filling, packing and pouring of buckets-full of pay-dirt into the high-bankers. It was hot out there in the sun, so one of the participants treated us to the use of his shade canopy where we could eat lunch or take a break. We only shut down the high-bankers once during the day to fuel the motors and do a quick clean-up of the high-grade portions of the high-bankers to get an idea how much gold we were recovering. We were doing pretty well! 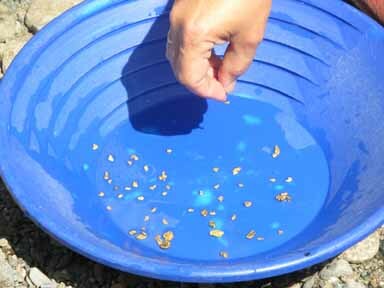 And we were also getting some nice gold nuggets! Everyone was pushing as hard as we could to break a production record in gold recovery. The previous high-banking record was 64 pennyweights (3.2 ounces). Going into the sixth day of this Project, there was no doubt in my mind that this was the hardest-working high-banking team I had ever been with! The high-banker clean-ups on the fifth day were as good as we had done all week. But we spent too much time digging in the ancient gray layer which was under the orange material. That stuff was hard and slow to dig! But it sure looked rich! Because we were spending so much time in it, we decided to have several participants do some very careful pan-sampling of the gray to see how much gold was being recovered from it. This took some doing, because it required extra care to remove every bit of the orange layer (which contained a lot of gold) off the top of the gray, without allowing any gold from above to drop down into the gray and give us a false result. 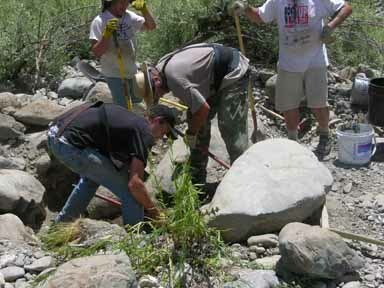 Each participant is invited to participate in the final clean-up steps. 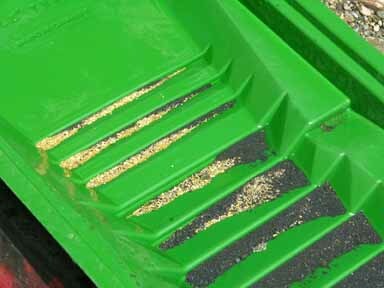 This is because there is a lot of work involved with separating all of the gold from all of the black (iron) sands. 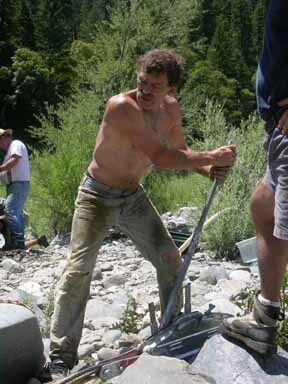 This usually all takes place on Friday afternoon after we have removed the Club’s mining equipment from the river. Since we were not far from Club headquarters, we decided to do the final clean-up in the back shipping area where we could be out of the sun and in a more controlled environment. The team pulled all the supplies together for a barbeque that would follow the week’s gold split. Final gold clean-up and split-off is always one of the best parts of these Projects. It is a time when we can all relax a bit, knowing that we worked as hard as we were able, and everyone has an opportunity to google a bit over all the gold that we recovered together. 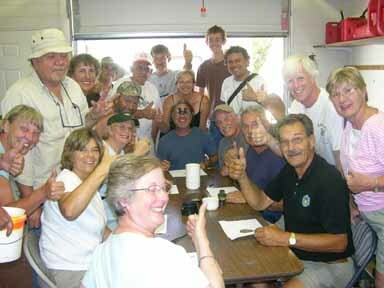 It is a time for some light joking around and expression of friendship and shared group camaraderie; a magic feeling that is timeless at the moment you experience it. The following video sequence captured the steps that we usually follow during a final clean-up. Background sounds in the video tell the story about how we all felt perhaps even better than the visuals! Witness the expectation and exultation that we all felt when we all realized that we actually did break the Club’s high-banking record!